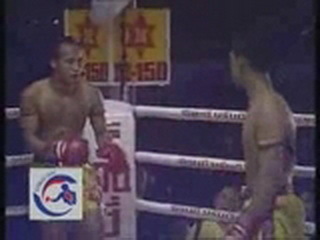 Suriya Sor Pleonchit fights Eh Phuthong at the 2003 Prince’s Cup tournament as part of the Celebration of King’s Birthday in Thailand. The winner of this fight for the semi final of the B-division would go on to fight the winner of the A-division semi-final, Farid Villaume of France. ~ by fatsoking on January 18, 2011.